Cape Town Life is indeed very relaxing, and I feel a certain amount of guilt still being here. One can spend days just wandering the streets, admiring the architectural mish-mash, from Art Deco, Classical, Victorian and countless others. I love walking, and Cape Town is a town for walking, and when you’re bored of the streets you have two fabulous mountains sitting right above the city, so a mere 30 minutes walk from Long Street where I stay, one finds a rocky trail curling up the Lion’s Head, or the Little Inactive Volcano as the locals of Bo-kaap apparently describe it. In a few debates with Anna, with a certain amount of devil’s advocate stirring on both sides, I’ve passionately defended Cape Town against her suggestions that Johannesburg is more vibrant. I don’t dispute that there’s obviously a whole world of black culture in the townships in Jo’berg, but I suspect this is also the case here in the Mother City, though unfortunately I haven’t managed to visit the townships here. When I arrived at Cape Town airport, I was shuttled in by a chap who was, well I’m not sure exactly what race, maybe “coloured”, who told me that the difference between Jo’berg and CT is that there’s less wealth-envy here, and people are just a little more laid back, and I can believe it. Joberg is where all the money is, as everyone is wont to point out, with the best jobs commanding the best salaries. Most Cape Towners are happy earning that little bit less though, and one can see why. There was an article in the paper a couple of days ago discussing gated communities, which are all the rage in Jo’berg. There aren’t any in CT, they’re not allowed by the district council. Unfortunately there is talk of relaxing these rules. Don’t do it! Cape Town also has all the colour coming from being an age-old port, the dividing point between great oceans and East and West, and having picked up the title “ the tavern of the seas”. Just being here is exciting, imagining all the famous voyages and explorers who have stopped in on their way to and fro around the globe. Soul searching is something I do plenty of here. Am I racist? Is everyone? The old joke – what do you call a black man flying an airplane? A pilot, you racist! – rings true, doesn’t it? Every time I walk into Carnival Court, if there’s a white person following me in, unless they’re obviously a tramp, I don’t worry as much as if they’re black, in which case I look at them properly and make sure they’re a guest. Walking along the street in the evening, if a group of men approach me, if they’re white I am not worried at all, whereas black, I am (slightly more) on my guard. Is this racist or just realistic? There was a stink recently when a *black* senior police officer in the Met Police Force said that the police in the UK need to stop and search more black people. The police have to be so careful about stopping anyone who isn’t white, for fear of being accused of being racist, but here’s the point (as I see it) – it is commonly published the proportion of ethnic minorities who are stopped and searched, and this is compared to the racial mix up of the country, the theory being that the two should be aligned. Surely though, we should see the proportion of crime committed by each group and compare this to the stop and search numbers. However, you will never see this number coming out, it’s too sensitive. Which I do appreciate – and I don’t mind if this number doesn’t come out into the public eye, as long as people understand the police, armed with the real numbers, should be free to stop and search whoever they think necessary without fear of a witch-hunt. We are so hypocritical about racism anyway. In the UK, you’re not allowed to say “coloured” but “black” is okay. However in South Africa, “coloured” is fine, as that is a specific term for mixed white black and some other racial groups. Reading the Cape Times as I do every day, there are often Invitations to Tender for government contracts, which detail that bids will score more points if the company tendering has more black ownership, management, and is spending more money on development, defined specifically as training black people! Now that to me is genuine racism! I feel uncomfortable in places here where there are no black people (De Akker Pub or the Fireman’s) but I don’t seem to have so much of an issue when there are no white people – there are some places on Long Street which seem to be exclusively black, why don’t I have the same problem with this? I thought it strange yesterday when I saw a white girl parking attendant. Depasco, my lovely café bakery on the corner of Long Street and, err, well opposite the Long St Baths anyway, seems to be managed by a white (looks Greek if anything) guy, but all the staff are black. I wonder if this is deliberate. Is it some kind of training initiative? Everyone here is really friendly, and the coffee’s good, plus I’m a regular now, I walk in and with a nod of understanding I am brought my extra-frothy cappuccino and breakfast wrap. This is why I come here, but I’m just curious about the staffing. The guys working here are at different levels of experience, some are great, others obviously new and a bit nervous, including a very cute impish girl who started two days ago and is supervised whenever she’s near the cash register. All good fun! One of the treats I enjoy whether in the slums of Rio or up a mountain in Tanzania is the BBC's Today in Parliament show. However, recently a certain aspect of MPs' conduct in the house has been somewhat disappointing, and I fear some of the prime culprits lurk on my side of the house. I refer to the practice of making supporting jibes in the middle of speeches or questions. For example, an honorable member may say 'I have examined x's report' and pauses for breath or effect, at which point one hears a 'oh really, do tell' or similar in the background. This juvenile practice must stop. Furthermore, the Tories need to immediately stop harping on about Labour stealing their policies. This will not win any votes. Carry on innovating and developing policy, and the voters will realise who the driving force in parliament is. Silly personal attacks are also unproductive. The Swedes invited me to join them in watching Rent – the Musical. This has been on in London for years but I’d never got round to seeing it. The girls had all seen the movie, so had a better idea of the story than me, but it still proved fairly easy to follow. 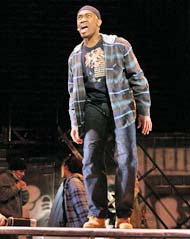 Rent is a rock musical, with music and lyrics by Jonathan Larson based on Giacomo Puccini's opera La bohème. The musical tells the story of a group of impoverished young artists and musicians struggling to survive and create in New York's Alphabet City in the thriving days of the Bohemian East Village, under the shadow of AIDS. Particularly noteworthy performance from the Tom Collins character, played by a chap called Aubrey Poo (pronounced Poo-ay), who has a fantastic resonant voice. The afternoon before the play Sofia and I walk around town, visiting the National Art Gallery before walking up and around Bo-kaap. A muslim lady invites us in to her house. It’s small but homely, with pictures of Mecca and beautiful arabic script on the walls. Later walking back past with the gang, Sofia takes her cousins in to sing a thank-you song, which she records on her mobile. Up at the top of Bo-kaap we visit the Noon Gun Restaurant again, though I'm not convinced Maria actually remembers me! The food is good again, and this time in reasonable quantities! Next day, down at the waterfront, I pop into the large Musica store. One tends to take the HMV and Virgins of the London world for granted. You don’t expect to find anything like that in places like Peru, but here in developed South Africa, you would have thought there would be some good stores. Unfortunately the dominant player is Musica, and they’re hopeless, so eventually I give up and pop into Mitchells brewpub, avoiding the Old Wobbly, which is 10% or so (Gerhard apparently used to drink jugs of it as a student), and sticking to my Bosun’s Bitter, plus trying a 90 Shillings which is almost stout-like. 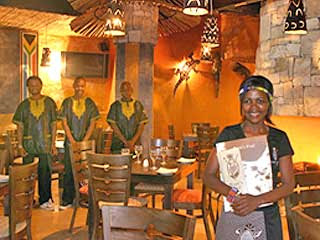 My last evening, I try Nyoni's Kraal restaurant in Long Street, which according to the paper today has just won an award, and has been tipped by locals. They certainly are very friendly, and it’s an all black staff. The kitchen is clean and busy, and I’m sat facing it, billy-no-mates on a table for four! I’m not feeling especially hungry, so go for the snoek and chicken terrine. It sits waiting for my waiter (or should I say waitron in SA?!) to bring it over to me for a couple of minutes. Bad! I enquire about wines but they only have Spier wines by the glass, so I stick with my Hansa Marzen Gold, bottled beer of choice for the discerning. I notice the food sitting waiting for waiters is a bit of a theme, at one point a kitchen person admonishes a waiter for leaving a dish until it’s cold. It still goes out. For me, they really burn their bridges in terms of tips by making me wait well over five minutes just to break a 20 note into 10s for tips!